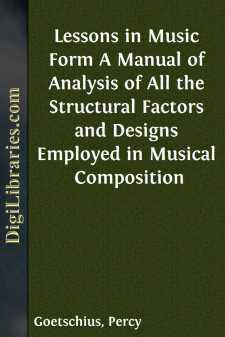 THE NECESSITY OF FORM IN MUSIC.—So much uncertainty and diversity of opinion exists among music lovers of every grade concerning the presence of Form in musical composition, and the necessity of its presence there, that a few general principles are submitted at the outset of our studies, as a guide to individual reflection and judgment on the subject. Certain apparently defensible prejudices that prevail in the minds of even advanced musical critics against the idea of Form in music, originate in a very manifest mistake on the part of the "formalists" themselves, who (I refer to unimpassioned theorists and advocates of rigid old scholastic rules) place too narrow a construction upon Form, and define it with such rigor as to leave no margin whatever for the exercise of free fancy and emotional sway. Both the dreamer, with his indifference to (or downright scorn of) Form; and the pedant, with his narrow conception of it; as well as the ordinary music lover, with his endeavor to discover some less debatable view to adopt for his own everyday use,—need to be reminded that Form in music means simply Order in music. Thus interpreted, the necessity of form, that is, Order, in the execution of a musical design appears as obvious as are the laws of architecture to the builder, or the laws of creation to the astronomer or naturalist; for the absence of order, that is, Disorder, constitutes a condition which is regarded with abhorrence and dread by every rational mind. A musical composition, then, in which Order prevails; in which all the factors are chosen and treated in close keeping with their logical bearing upon each other and upon the whole; in which, in a word, there is no disorder of thought or technique,—is music with Form (i.e. good Form). A sensible arrangement of the various members of the composition (its figures, phrases, motives, and the like) will exhibit both agreement and contrast, both confirmation and opposition; for we measure things by comparison with both like and unlike. Our nature demands the evidence of uniformity, as that emphasizes the impressions, making them easier to grasp and enjoy; but our nature also craves a certain degree of variety, to counteract the monotony which must result from too persistent uniformity. When the elements of Unity and Variety are sensibly matched, evenly balanced, the form is good. On the other hand, a composition is formless, or faulty in form, when the component parts are jumbled together without regard to proportion and relation. Which of these two conditions is the more desirable, or necessary, would seem to be wholly self-evident. The error made by pedantic teachers is to demand too much Form; to insist that a piece of music shall be a model of arithmetical adjustment. This is probably a graver error than apparent formlessness. Design and logic and unity there must surely be; but any obtrusive evidence of mathematical calculation must degrade music to the level of a mere handicraft.